I took some photos atop the pedestrian overpass connecting the New Antipolo Public Market and the Robinson’s Place mall. The overpass is across Sumulong Highway, which terminates nearby at the intersection with Antipolo Circumferential Road (Daang Bakal), which is currently being widened. The overpass is a steel structure, including the flooring, which reminded me of factories. This industrial look is not new as there are other overpasses that have been constructed in Metro Manila similar to this. A look at Sumulong Highway towards Masinag. The highway has 4 lanes and at this section has sidewalks on either side of the road. There is no median island to separate opposing flows of traffic. The Antipolo Public Market is on the left side. A view of Sumulong Highway towards the Antipolo Shrine of Our Lady of Peace and Good Voyage. The Public Market is at the right and the mall is at the left. 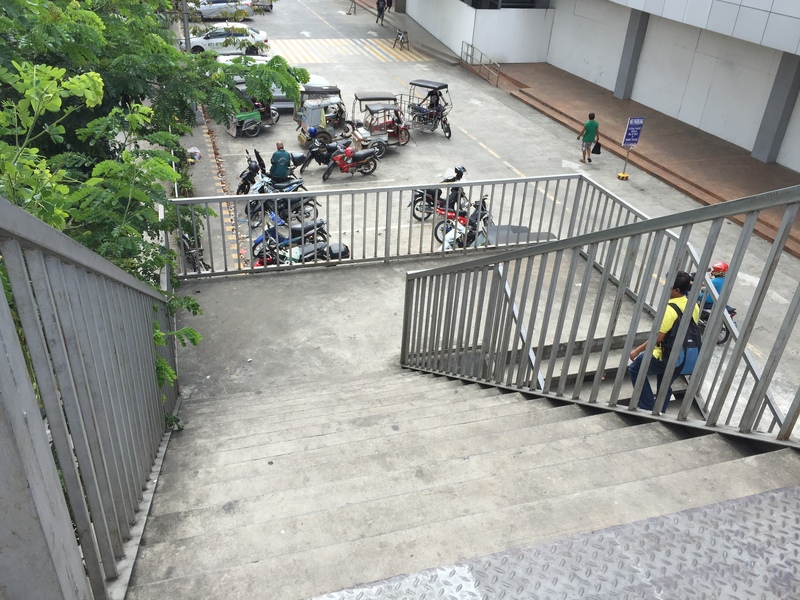 The overpass’ stairs are a bit steep and perhaps not so friendly to senior citizens. There should probably be a ramp for persons with disabilities or for cyclists to use as they carry their bicycles to cross using the overpass. Despite calls from some advocacy groups for pedestrians to be prioritised and for them to cross at-grade, the reality is that we are still far from achieving safe roads for pedestrians given the way motorists run their vehicles. In the case of Antipolo, many jeepneys, UV Express and tricycles (freely roaming the city) are operated by reckless drivers. Private vehicle drivers are not so different and I have seen scenes of road crashes along Marcos Highway and Sumulong Highway where those involved are private vehicles including motorcycles. Clearly, many of these people should not have driver’s licenses in the first place given their mindset when driving. So until this improves, pedestrians are safer when they do use these overpasses. Of course, that goes without saying that the location and design of overpasses need to be thought over carefully so that these facilities will be used and not just become white elephants. By d0ctrine in Infrastructure, NMT, Pedestrian on November 10, 2015 .